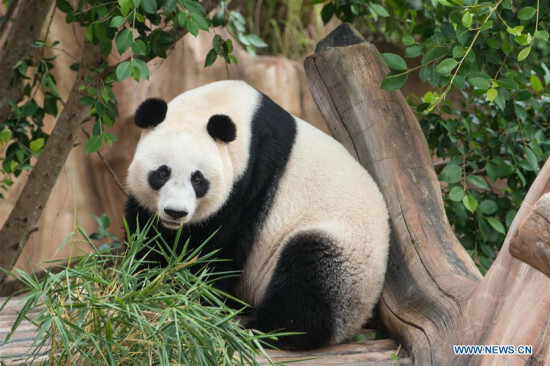 Indonesian officials supervising the Chinese giant pandas now kept in the nation's safari park said on Thursday that the exotic animals were ready for public expose in the near future after completing a 31-day quarantine period. Taman Safari Indonesia (TSI) Director Jansen Manansang said that results from health examinations over the male and female pandas, namely Cai Tao and Hu Chun, showed excellent records with two animals already well-adapted with nature, climate, weather and with crews who take care of them in the TSI's panda facility. "Figures from health examinations over them were excellent. The most important things now were the food and the habitat. They were exactly the same like in their origin places," Jansen said in TSI premises in Bogor, West Java. TSI management is now in the process of assessing the proper date to initiate the public expose for the Chinese giant pandas, he added. According to Jansen, the TSI would limit a maximum 200 people to watch the pandas each day. TSI has built a 5,000 square meter panda exhibit in its premises, called Indonesia Panda Castle, located about 55 km south of the capital Jakarta. It was situated on a hill with a height of 1,800 meters above sea level and average temperature between 15 to 24 degree celsius. The exhibit is featured with Chinese culture-themed restaurant and a store that sells Panda-associated souvenirs. Cai Tao and Hu Chun arrived in Indonesia on Sept. 28 after going through 5-hour direct flight from an airport in China's Chengdu city. The arrival of the Chinese giant pandas followed the China-Indonesia breeding loan agreement, which enables the two pandas to stay at least 10 years in Indonesia before returning to China after breeding their children for Indonesia.